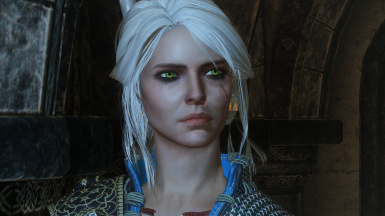 Adds The Witcher 3: Wild Hunt's Ciri to Skryim. This mod may not be copied, reproduced, distributed, transmitted, broadcast, licensed or otherwise exploited for any other purpose whatsoever without the prior written consent of the respective owner. This mod, nor its containing assets, may not be re-uploaded or otherwise shared without direct and explicit, written permission. If permission is requested and subsequently granted, you are still bound by the permission-seeking responsibilities of any and all assets used in the creation of this mod or its containing assets; in addition to any other terms disclosed. Do not re-upload this mod to Bethesda.net, Steam Workshop, or any other website without permission! No mod packs; no mod pickers. Bug Fixes: Resolved condition conflicts with speaking activators. Unsquashed nose textures and small face tweaks. 2.41: Corrected boot skeleton nodes. Ciri's battle music added to Combat Music list. Custom eye, eyelash, and teeth meshes based on TW3 assets. Face and hair tweaks. Combat Changes - She teleports. Added dialogue option for outfit change. Tell her to you want to "change her outfit" and she'll remove her default outfit so you can set it yourself. New skin texture and normal map. Fixed normals for hair and reweighted to Head bone only. Lots of tweaks to face, eyes and hair. Added a little more dialogue. Tweaks to head mesh, textures and eye textures. Japanese version with Voice Patch by BowmoreLover. La version française du mod by jihan02. La traducion Español del mod by micbasster. 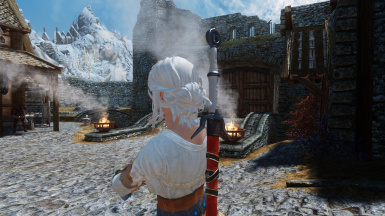 This mod adds The Witcher 3: Wild Hunt's Ciri to Skryim. If you haven't played the Witcher series, I highly recommend it. And a big thanks to CD Projekt RED for allowing use of their assets so mods like this are possible. She can be found in the Winking Skeever in Solitude. If you have any trouble getting her to follower you, please, type in the console 'set playerfollowercount to 0' and try recruiting again before you report it as a problem. Please note: I did not make her head using RaceMenu sliders and therefor have no preset to share with you. And since I did not use the vanilla head as a base, I'm under the impression that using this head on your played character, while very possible, is more complicated to implement than creating a preset. For that reason, I'm not planning on including that feature at this time. Also: I did not import the actual head from the Witcher games, but my ego is flattered you think so. 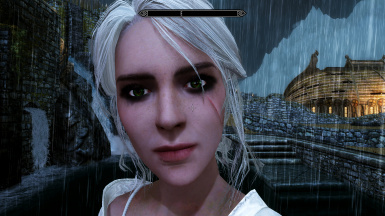 If you're looking for another follower, try my Yennefer and Keira mods. I've also contributed to this Geralt, Triss, and Cerys an Craite mods by imAarwyn. If you're looking for a playable version of the hair, try here. If you're looking for Ciri's outfit, try here. Or you can find her DLC outfit here. If you're looking for ravamped face textures, try here. Think of this as a downloadable, stand-alone, vanilla follower that happens to look and sound like Ciri from the Witcher 3. She has custom made, high resolution skin and eye textures and over 440 unique lines of dialogue. Japanese Translation by BowMoreLover: Courtesy of Dragonporn. Thank you imAarwyn for the video and gruntman438 for the mod review! 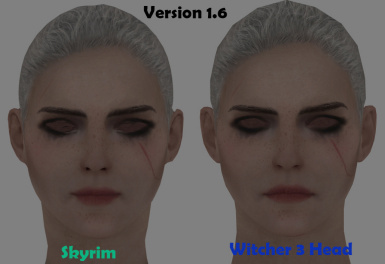 If you use a Follower Overhaul mod, such as EFF or AFT, you could potentially be able to perform the 'Force Recruit' on her, but it may result in bugs and some of her advanced functionality not working. I don't recommend it. installing the files, run FNIS for users and update your behavior files before starting the game. As of Version 2.4, Ciri and Yennefer have a few conversations. This should start automatically if you have compatible versions installed. If you do, there will be a Compatibility entry in the MCM telling you it's setup correctly. Meshes: I made the head in Blender using the Citrus head and it's .tri files. That means her mouth moves when she talks, makes facial expressions, etc. Tweaks were also made in Racemenu's sculpting mode. The hair straight up belongs to CD Projekt RED. Textures: I hand-painted the head texture in photoshop using a lot of healing brush. The body textures were painted on the CBBE body using SG Female Textures by HelloSanta, HHaleyy, and Zonzai as a base. I included normal and specular maps in this release as well. She's using a CBBE Nevernude body by default, but you can replace the meshes in the Skryim/Data/Meshes/Actor/Character/Ciri/ folder. The body textures can similarly be replaced using the same folder structure, but they may not fit seamlessly next to my head texture.